Check out The Blog of C.R. Moss where I was interviewed! The summer movie season seems to be filled with sequels, prequels and remakes. Some "original" movies are on the list. They just aren't on my to-watch list. Well, I don't know if I'd consider Ant-man as original. It's made from a comic book character. Insidious Chapter 3 was really good. I was surprised. The second movie wasn't terrible. It also wasn't nearly as good as the first one. Chapter 3 doesn't add anything to the genre, but it did the first movie proud. It's a prequel. The events happened before Insidious. I was a bit worried about this one. The trailer showed that Chapter 3 surrounded a teenage girl. There was clearly a love interest. I didn't want to sit through another teen movie like Silent Hill 2 or Ouija. I was kinda scarred by Ouija. The trailer looked so good. The movie was so bad. A horror movie about perfect rich kids who were all alike. Boring. Someone totally messed up Silent Hill with that sequel. I need a real horror movie not one made for kids. Insidious was both. Some characters were simply there to move the plot along. They were so flat. The brother, he had no point except to bring in paranormal investigators. The "love interest" was only good for that one scene from the trailer with the main character's phone. Not uncommon for a horror movie. I didn't miss them. Insidious, you are forgiven for your flat characters. Everyone else had some depth. I could relate to Quinn Brenner (Stefanie Scott) and I usually can't relate to teenagers in movies. Not because they're younger than me but because their teenage experience seemed perfect, way different from mine. Quinn didn't have a boyfriend. She had a crush, but she was also focused on getting into the college of her dreams and going away from home. I felt so bad for her. All she wanted to do was contact her dead mother and ended up getting haunted by some vicious demon. Halfway through the movie, she was in two leg casts and a neck brace. She was being tormented by a demon and she couldn't run from it. She was alone in her torment. Like most haunted house movies, her father didn't believe her. Since Quinn was injured, she was alone in her room most of the time. I'm wondering where her father was while the demon was throwing her around. I doubt he wasn't in the apartment. Her father was kind of a douche but he wasn't that neglectful. He clearly loved his children. The movies started with Quinn visiting Elise because she wanted to contact her mother. Elise knew about the demon after Quinn's visit but was too afraid to help her. We learned more about Elise in Chapter 3. She wasn't just the person someone called when they needed an entity removed. She wasn't the powerhouse we've gotten used to. She became that way at the end of the movie. At first, she was terrified of her gift because of a vengeful ghost and she was lonely because her husband died. It was heartbreaking every time she went to bed clutching her husband's sweater. She had some moments at the end of the movie that had the audience cheering. She was awesome. The scares in Insidious Chapter 3 made even me jump. The movie was happy with the jump scares. They weren't overdone. The movie's pace was good. We had enough time to get to know the family and Elise, but not too much time. Each scare was well placed . Unlike Annabelle, Insidious Chapter 3 didn't have too many haunting moments. There was just enough to keep the story going. Those moments were intense. I have to hand it to Insidious. It knows how to be creepy. At one point, I wondered if the movie was throwing in scares just for the sake of it. All the things happening to Quinn and Elise need to have a purpose other than making the audience jump. Since this is an Insidious movie, I decided to shelve that criticism. Good thing I did. All the scares had a purpose. Well played movie. That demon was awesome. Kinda bad to say that since it's evil, but that thing was messed up. Since this is a horror movie, a messed up demon is good. It's first appearance was so wrong on so many levels. It looked like a normal man except it had this really awful smile and was waving it's arm like a pendulum. Half the body was in shadow. All we saw with that smile and that wave. It was weird. In a good way. When it was torturing Quinn and Elise, we say mostly it's oily footprints. Sometimes it appeared as a dark figure. The movie knew how to work that demon to maximize scares. It's full form was terrifying. Insidious Chapter 1 introduced us to The Further. Chapter 2 showed move of it. Chapter 3 took us deeper into The Further. It's like hell without all the fire and brimstone. Not everyone there was evil when they were alive. Some were brought there by demons. I really like the concept of The Further and how it's been handled in the movies. The name's beginning to grow on me. Elise is brave for going into the The Further to face that creepy demon because... hell no. I could not do it. I'd probably die from a heart attack. 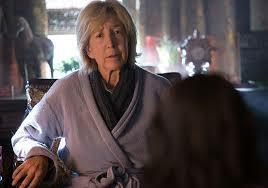 Insidious Chapter 3 is like Else and co's. origin story, sort of. I could never remember the names of her sidekicks but they're so silly and fun. It's hard to forget their personalities. Chapter 3 does some foreshadowing for Chapter 1. One was well played. Another wasn't needed, but didn't take away from the story. I've been dying for a good horror movie and Insidious Chapter 3 delivered. I had to share this. Sinister 2 comes out in August and it looks amazing! I still can't watch the lawnmower scene from Sinister without completely freaking out.